The health of your worship ministry depends on who you invite in, and how you invite them in. You need a healthy process to bring new team members, no matter what sized church you’re in. We have resources to help you build an audition/qualification process step-by-step. 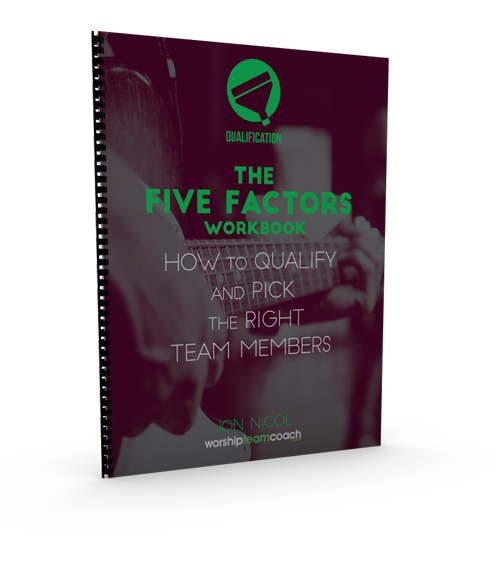 What the Five Factors are, and how to create your qualification standards around those. Why TALENT is never enough. And how you can hurt your team if you only look at that. How to ask THE RIGHT QUESTIONS to determine if an applicant is right for your team. Practical ways to determine if someone is really "called" to the worship ministry. Click this button, complete the short form, and get instant access. Enter your first name and email address and click the button below to get immediate access to the workbook. This workshop gives you a step-by-step plan for creating a system that will help you attract, qualify, and invite the right people on the team. A philosophy for growing your team. Done-for-you, customizable applications and forms. Tools to help you determine your qualification standards. Guidance for how to say NO when someone doesn't qualify. Tips on how to run effective auditions and interviews. Plus these ready-made tools and bonus resources. Want to explore ALL the RENOV8 Workshops?